Unité de coin ML242 1BR / 1BA Grande vue WiFi Parking gratuit Village! Vue magnifique sur le lac Shavers et les montagnes depuis le balcon. Vous pouvez voir l'ascenseur Ballhooter du balcon. L'unité de coin a une fenêtre supplémentaire pour voir le lac et les montagnes ci-dessous! À quelques pas du village. Une fois que vous êtes arrivé, garez-vous sur le parking surveillé et vous ne serez plus obligé de conduire avant votre départ. Le restaurant, le salon et le centre de conférence sont tous sur place. TV et lecteur DVD. Cuisine entièrement équipée avec réfrigérateur, lave-vaisselle et micro-ondes. Cuisinière et four en taille réelle. Machine à café. Salon confortable avec un canapé convertible. Dîner pour quatre. Une laverie à pièces est située dans le couloir, près des ascenseurs. It was a clean, comfortable, and convenient stay! The place was exactly as advertised. Nothing fancy, but good enough and in a great location at a fair price. I might not stay in a unit of this size with my two kids again, just a little snug with ski gear, etc. Two adults and one kid maybe. But otherwise worked out well. The building did always seem to be a bit warm. Even with the heat turned down we still cracked the windows a little and had a couple of fans going. Better than being too cold I suppose! A great spot for this ski in and ski out building! Check in was easy and smooth at the guard shack, along with the front desk! Very friendly! The condo is great! You can easily fit four people in with the pull out couch in the living room and the bedroom was perfect. We loved that this condo was exactly what we needed, which was a place to sleep, cook a meal and relax. We don’t need the extra fluff, we came to ski and relax. The location is RIDICULOUSLY PERFECT. :) Thank you so much for letting us stay in your home and we plan to visit again soon. Great location. Condo was clean. Three adults fit fine in this room. Two in the bedroom and one on the couch. The location is great! Really convenient to the Village and a true ski in / ski out. This was my 4th trip to Snowshoe and first time staying at the main mountain (we usually stay at Silver Creek). I booked this condo the afternoon before our stay started and the reservation went smoothly. The condo was spacious, clean, and well equipped. The rack by the front door was awesome for the ski gear. I would definitely book this condo again if I were to come with a smaller group and it was available. I was really frustrated with my last trip to Snowshoe. I've rented at the Silver Creek lodge three times and this is my first stay on top of Snowshoe. 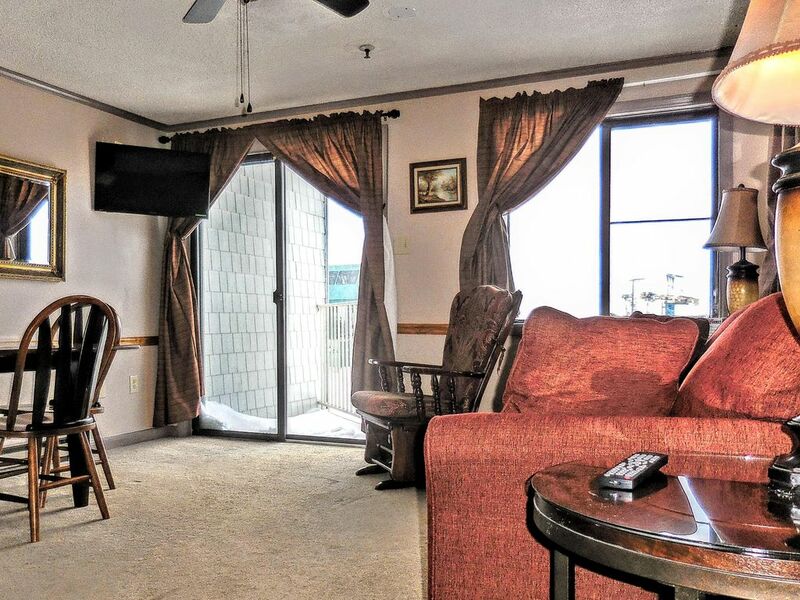 This Mtn Lodge 1br/1ba is a lot smaller than the 1/1 at Silver Creek. It didn't really work well for two adults and two adult sized teenagers, one on couch and one on a blowup mattress. My main problem was the kitchen: It was tiny with no counter space to make meals, the old lopsided burner stove made it very hard to cook (especially 4 eggs in a fry pan -you had to keep rotating the pan after putting in each egg), there isn't even a drawer for the silverware tray, there was only one nonstick pan and no scrubber to clean the metal pans, no dish soap, no wisk, etc. Skiing and staying on the mountain is expensive, so I try to make all our meals in the condo, and it was very difficult in the Mountain Lodge unit. Also, when following the phone instructions bolted to the wall above the phone, the phone did not work. I needed to call the Safety Patrol at Silver Creek and couldn't. When I asked at the front desk, they gave me different phone instructions. The parking was difficult, only one space open on Friday at 6:30pm, granted a few snow piles took up space. The bedroom only has one night stand so one person didn't have a reading light or place to put a beverage. I was really disappointed that the bedroom didn't have a tv, (teenagers and parents watch different tv shows). I guess it was the other units that had the second tv. The bathroom had a nice new high sink. It was a hot hike to the Depot the first morning in full gear carrying your skis. I would suggest getting your ski tickets and then coming back to the lodge to put on gear and ski from there. The last negative comment goes towards VRBO. I was woken up at 7:10 am on our last VACATION morning with an email from VRBO to rate my stay--Ugh. This Mtn Lodge unit did have a nice view and it was easy to get on the slopes at Ballhooter. Sorry for the negative comments, but VRBO kept pestering me to rate my stay.